As Simon has previously discussed, “populist” has become a smear, epitomized by David Brooks’s frankly offensive attempt to classify populism as an “organization of hatreds” akin to racism and sectarianism. Brooks asserts, without support, that populism amounts to “simply bashing the rich and the powerful,” “class war,” “random attacks on enterprise and capital,” and a “zero-sum mentality” — proving that ideologies are easy to bash when you assume their properties. 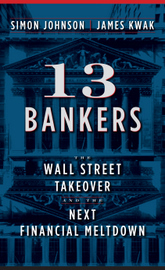 The substance of the article is that these prominent financial industry veterans — a billionaire hedge fund manager, a former Republican treasury secretary (and investment banker before that), a former Citigroup CEO, a former Republican head of the SEC (and investment banker before that), and the founder of one of the largest mutual fund companies — all support financial sector reforms that go at least as far if not beyond those proposed by Paul Volcker (another reform advocate that few columnists dare to call a populist). Brady, for example, is open to the idea of not just banning proprietary trading by government-insured banks, but banning securities trading altogether by such banks. This should come as no surprise — he was saying similar things a year ago. Of course, one could argue that these distinguished (and very rich) men are not actually “populists” — they are sensible, experienced advocates of reform who seek closer regulation of the financial industry because they want to create a stable financial system that promotes economic growth. Since “populist” has no independent meaning, you can reserve it for the people you don’t like and find another word (“reformer”?) for the people you can’t easily write off. This entry was posted in Commentary and tagged financial regulation, populism. Bookmark the permalink. First, wingnuts and predatorclass apologists, propagandists, disinformation warriors and bruters of rightwing mantra’s cannot and will not define a populist. The people have the right to…”…petition the government of redress of grievances”!!! A populist is one who defends the Constitution and the pre-existing laws of the land against all enemies foreign and domestic. America is in peril. Our very future, and the futures we bequeath our children depends on our actions this day. America has somehow, pernicious way shapeshifte into kleptocratic, oligarchic, fascist state. We now inhabit Amerika! The Constitution “…is just a goddamn piece of paper”, Corporations now own rights formally afforded to human beings. The predatorclass owns and controls the government and everysingle politician in the government. The predatorclass and predatorclass oligarchs dominate all the decision making, and a massive bulk of the nations wealth and resources. Our founding fathers are squirming in the graves. This is NOT America!!! We, the people, – the other 99.5% of population now inhabits, and must hazard and endure Amerika!!! I agree with your paragraph saying these guys aren’t populists but rather a superannuated kind of system mandarin. A young trader would be right to call them fogies who want in principle the same thing he does but are too squeamish to face the logical outcomes of what they did, after all, spend their careers fighting to “build” (i.e., destroy). A coincidence? I was rereading some Dostoevsky yesterday and went over one of his frequent passages where he blames the older generation of liberals for laying the groundwork for the radicalism of the current generation, and satirizes their discomfort in the face of this new radicalism. And yet they caused it, according to D.
So here too we have pseudo-wise men who care about the System Uber Alles but think it’s gone too far in some undesirable direction. Just as back then, I agree that this is an important symptom of the rot. But I don’t think Tuchman would call these “populists” either. I agree there’s no current stable definition of populist, but it’s not “random” either. The Populist Party of the 1890’s had real power for a while, controlled a few state legislatures and had a US senator. One of their primary issues was opposing the then-emerging issue of corporate personhood. they saw what was coming. Most of them were midwest farmers who were getting screwed by banks and losing their farms. The party split on whether to try and join forces with the Democrats who returned the favor by backstabbing them. But their legacy did live on, Teddy Roosevelt and his trust-busting was clearly influenced by them. Populism is as American as apple pie. Intriguing reply Russ. Radicalism is born out of desperation. If people are happy and prosperous, radical don’t have much play or voice. And that is good. But, when the world turns pearshaped, and people are forced or oppressed into circumstances of desperation and hopeless, – the radicalism find purchase, roots, and flowers. From my pedestrian perspective, – it reduces down to the rule of law. Either we have laws, and everyone is applicable or culpable to those laws, – or in practical effect and reality – there are no laws. And in a world where there are no laws – there are laws for anyone predators. It’s kill or be killed!!! I wish you were wrong Tony, but I think you summarized were we are pretty well. I’ll add two other problems to the list. The political and financial organizations are not the only ones that are broken. Upper management in all productive sectors has, for decades, looked only at short-term gains, and quarterly reports, and have eviscerated the companies they run. We no longer make tangible things or innovate. The talent and tools to do it have been deliberately discarded. The techniques that sell us anything from hamburgers to Paris Hilton work to a large extent. They are now being used to sell a large portion of the population ideas. They buy koolaid that is exactly designed to deflect them from looking at the real problems. Rush Limbaugh, Tea Baggers, Socialism, etc., etc. are all well-financed tools to keep the stupid-quo intact. Word Russ. The problem is in the infrastructure. The current regime, like the previous regime is purchased by, bedded with, and beholden to the very “…den of vipers and thieves” that are singularly and exclusively responsible for aiding and abetting the most devastating economic crisis since the great depression!!! As long as these shaitans, vipers and thieves hold power, and are given voice, – America is doomed!!! These monsters do not care about us, – the people – nor do they work for us – the people. Giethner, Summers, and the Goldman Sach cabals that own and control our government will NEVER work in our favor. They are beholden to, and minions of the predatorclass and the finance oligarchs – who FAILED miserably, in everyway- as financiers, as accountants, as regulator, or honest citizens, and leaders of government, – they FAILED, and they FAILED horrifically. There is no walking away from this grotesque FAILURE, and there is, or should be no walking away from CRIMES!!! The predatorclass is accountable, and must be held accountable for FAILURE, ABUSE, DECEPTION, and CRIMES!!! If not- then all bets are off, be we then will inhabit a world of lawlessness and no laws. And in a world where there is lawlessness and no laws. There is lawlessness, and no laws for anyone predators!!! Where the body is, there the eagles will gather. Personally, I am proud to call myself a populist, and David Brooks is a toadying twerp, familiarly known in the trade as an a*****e. Next, I suppose you will be quoting Larry Kudlow and Thomas Friedman? Actually, today’s populist would be an Anti-Corporatist, an Anti-Monopolist, an Anti-Globalizationist, an Anti-Financializationist. I believe both Keynes and Ayn Rand would so classify themselves were they still with us. Instead, we get instruction from David Brooks? And people wonder why newspapers are dying! It’s only called ‘class war’ when those on the losing side (ie most of us) fight back. The anti-populist arguments are rooted in economic theory and political platitudes, such as “international trade is self balancing and so is good for everyone”. I particularly take issue with the “zero sum mentality” comment. There is no doubt that real industry and commerce can “increase the size of the pie” so an entrepreneur can make a profit while benefitting those associated with his business and not harm others. Stock and bond trading is not a real enterprise. It does not create profits, but moves them from one investor to another. Trading is a “zero sum game”. It does not increas the size of the pie (profits from real commerce and industry) it just changes the way the pie is sliced. David Brooks and others seem to be deliberately trying to confuse populism with demagoguery. The two are not the same. I think Tony is on top of it. I think this thing might just blow up in some people’s faces. Regulation, politics, etc is just so much meaningless crap to these plutocrats. Might several million unemployed “populists” surrounding the capital & white house have an impact? A peaceful protest. I don’t think anyone wants blood being spilled on wall street. . . or maybe cla*****e ? Interesting piece. Don’t know if this relates to “populist”? I feel truly sorry for this poor guy. Very well said, and we can see how they can afflict other nations using their de facto (if not outright) ownership of the US government. Years ago I took an oath “to uphold the Constitution against all enemies, foreign and domestic.” The Constitution needs defending, and the enemies are not foreign. I still see the chance that this can be unwound peacefully. William Isaac on the News Hour calls for Glass- Steagall like reform, admitting he was wrong in the ’90s and that Volker was right. Populist? Hell no, he just wants to preserve whatever wealth he has left! But we are the incidental beneficiaries. Continuing, where is the sovereign that will tell these crooks and criminals to bugger off? It actually has become a matter of national security for many nations (respectively), all against the same group of oligarchs. Is “populist” just another word for sensible? Yes, and, of course those who support the oligarchs will try everything in their power to turn a word from positive to negative if it abets their cause. I use the word abet to describe oligarchic support just like abetting desribes a criminals assistant, since the oligarchs are the present day robber barons (as the oligarchs were described in the early 20th century). Brooks is an elitist, that is a snobbist supporter of the rich and powerful oligarchy set on the destruction of the plebian society that they now rule. That’s not how I read David’s column. He may be a little more cautious than the Baseline Scenario crew about new financial regulation, but he shares the same basic sympathies. The populists he was criticizing are the extreme Tea Party folks that are bringing guns to rallies and things like that. David Brooks knows which side of the bread is buttered; he makes a lot of money writing his garbage, aka advertsing, for the highest bidder.